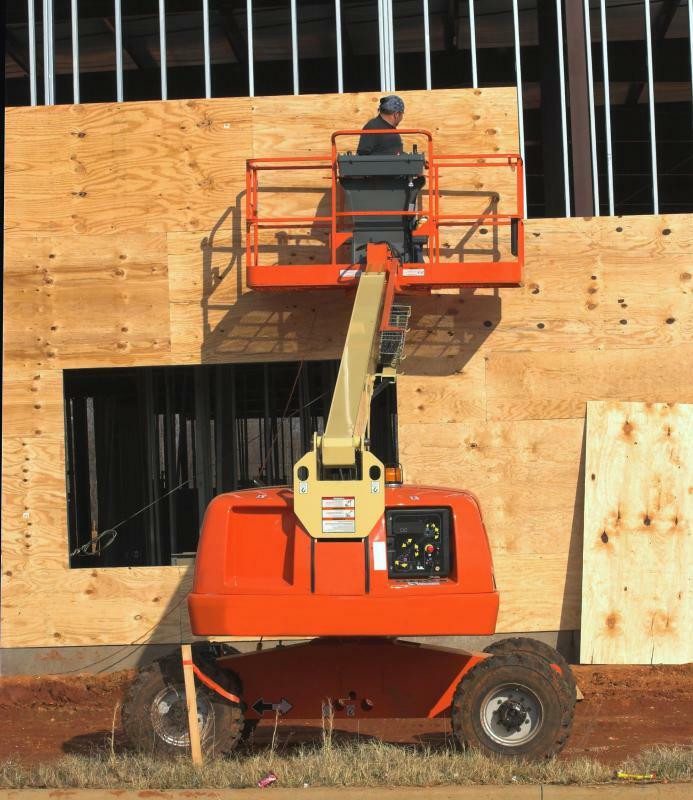 Plywood sheets being attached to the side of a building. Plywood is made of multiple veneer layers of wood glued together to create a strong, but not so attractive substitute for solid wood. 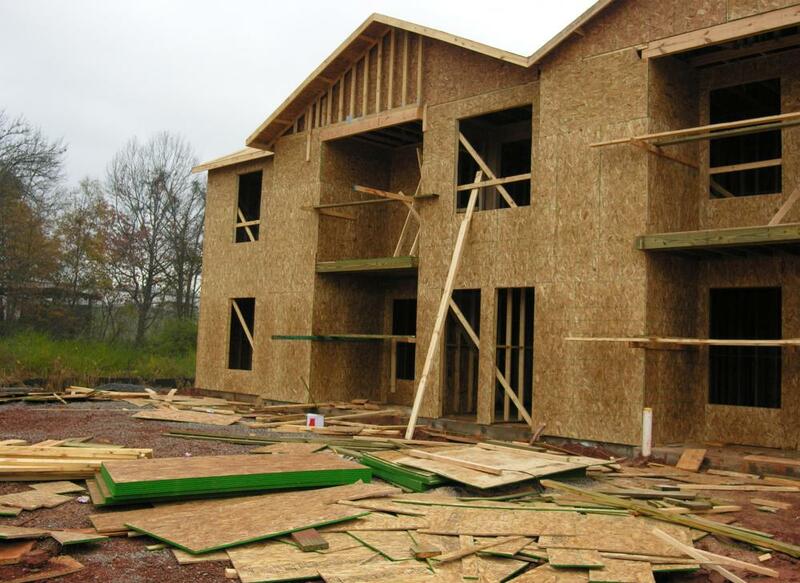 Plywood comes in a number of forms, and is commonly used to construct houses. Plywood is a wood product manufactured out of many sheets of veneer, or plies, pressed together and glued, with their grains going in opposite directions. It tends to be extremely strong, though not very attractive, and is treated in many different ways depending upon its intended application. Because of the way in which plywood is constructed, it also resists cracking, bending, warping, and shrinkage, depending upon its thickness. It is also referred to as an engineered wood, although it is made from a composite of wooden materials, and various forms of it have been made for thousands of years. The plies that form plywood are generally cut on a rotary lathe, which cuts a continuous roll of wood while a log, called a peeler, is turned against it. Rotary lathing is rapid and makes efficient use of the wood while turning out veneers highly suitable for plywood. Some lathes are designed to expose more interesting parts of the wood grain, although they may be more wasteful of the wood. Rotary lathed veneers tend to be dull in appearance, although perfectly functional. After the veneers are cut, they are overlaid with layers of glue and pressed together until dry to form a flat, even, tight piece of plywood. Plywood is sturdier than regular sheets or panels of wood, because the veneers are laid with their grains opposing, which also causes the wood product to resist warping because the grains pull each other tight. 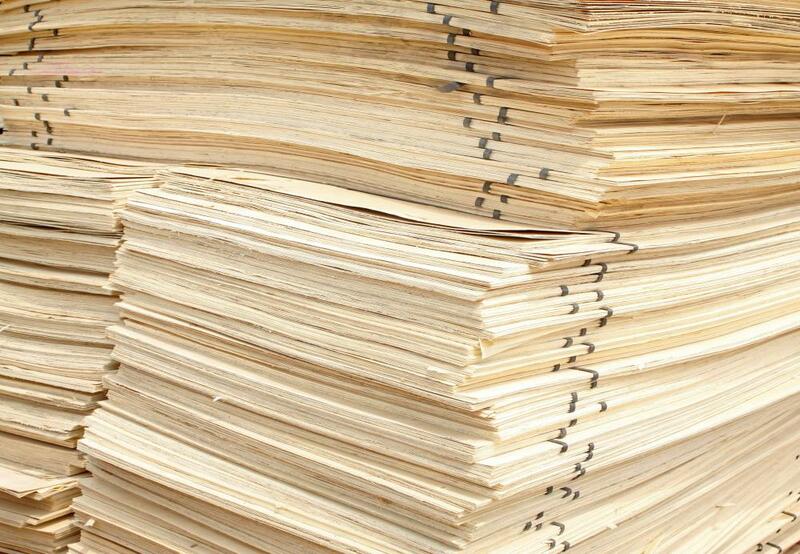 Plywood comes in a number of forms, including softwood, which is made from pine, fir, or spruce. 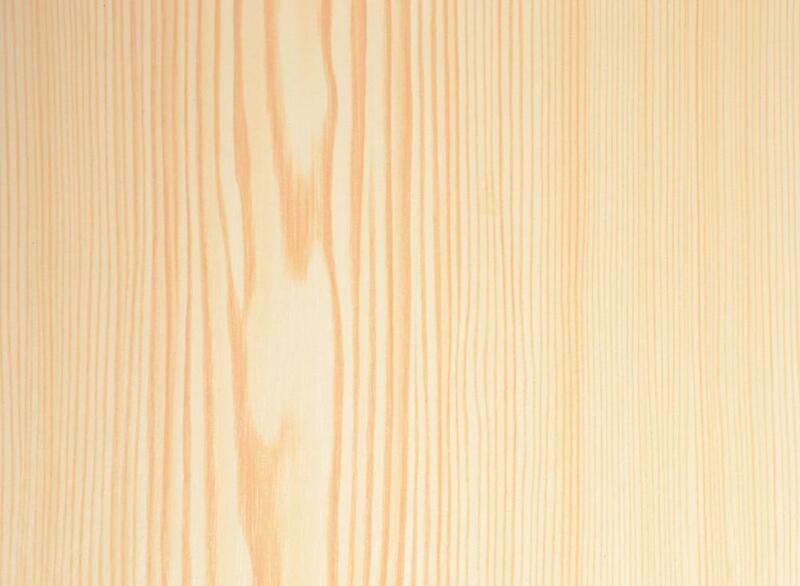 Softwood plywood is usually pale in color and is used in construction applications. It can also be decorative, with a facing veneer of exotic hardwoods. Mahogany or birch are used to create an extremely strong type known as aircraft plywood, because it was utilized in the construction of aircraft through the Second World War. If plywood is destined for indoor use, it is made with urea-formaldehyde glue, which dries quickly and is inexpensive. For that intended for use in outdoor applications or wet environments, a more expensive water resistant glue is used to prevent the plies from coming apart, or delaminating, and compromising the strength of the plywood. Plies range in thickness depending on the panels they are used in, from 1/10 inch (approximately 1/5 centimeter) to 1/6 inch (almost 1/5 centimeters). Standard sizes consist of 4 foot by 8 foot (1.2 by 2.4 meter) sheets in three, five, or seven plies. The end user can cut, reshape, or sand these sheets to needed specifications. What is a Plywood Saw? What are the Different Types of Fir Trees? What is a Douglas Fir Tree? Why is plywood so important? It seems that every construction site I drive by has large sheets of plywood on the sides of a structure. It doesn't matter that they aren't that pretty, because there are a few more layers that will go on top of them. They are just hiding under the brick or siding, doing their job while invisible to our eyes. @giddion – I also grew up around plywood. I have always associated it with two by fours, because that is what I saw the most. If my dad had any leftover plywood in the form of two by fours, I would take a piece and lay it across a big rock or block of concrete. I would then stand with one foot on either end of the board and pretend that I was surfing. The boards were really strong. Other boards probably would have broken in two with the force applied to either end like that, especially after being left out in a pile in the rain. The plywood held up against my weight, though. My dad builds lots of things from plywood, including the two work shops he has on our property. I've been around this type of lumber since I was a young child, and though I never really knew the definition of plywood, I knew what it looked like. It also has a distinct smell that reminds me of sawdust. This is probably just because I've been around while my dad was cutting it. Neither of the work shops are climate controlled year round, so the fact that plywood resists warping is important to us. We only have the heat or air conditioning on while we are in there, which isn't even every day. Plywood is a wood product of function and it should be selected for that purpose specifically. If a contractor is looking for a nice finish to his project then a different type of wood board should be considered. It is truly the wood product of varied purpose. Different types of functions for plywood include marine plywood, interior plywood and exterior plywood. There is almost always a use for this versatile builders construction material. As an employee of a plywood manufacturer I can tell you that much work goes into providing an excellent product that will get the job done. @Ubiquitous is correct in that a lot of suppliers have inferior quality of surface faces that they produce. There is however a large amount and wide selection of plywood boards and options available to builders. Different types such as teak plywood, hardwood plywood and maple plywood will have different textures that can provide either a smoother or more rough surface. I've always been offended by the appearance of plywood and in all of my projects as a finish carpenter. This ugly side is almost never appealing to my clients as well but there are many options on how to deal with this unsightly issue when using plywood. Luckily there are plenty of options available on the market to contractors and home owners alike. The most practical and reliable covering for plywood would be latex paint. The only problem with using paint is that some plywood suppliers produce qualities that have texture issues when applying the latex paint. Other options for covering the exterior plywood surface is to use some sort of siding or other cover material that masks the ugly but efficient wood underneath. Finally laminated plywood is an excellent option when you are in need of using plywood board that will see a lot of weather exposure. or what could plywood replace?